Figure 1. Existing standard hadrons and exotic hadrons. At the B Factory experiment, a series of new exotic mesons containing charm quarks (c) have been discovered. Unlike these exotic mesons, the newly discovered Zb particles contain bottom quarks (b) and have an electric charge. If only one bottom quark and one anti-bottom quark ( b ) are contained, the resulting particle is electrically neutral. Thus, the Zb must also contain at least two more quarks (e.g., one up quark (u) and one anti-down quark ( d )). 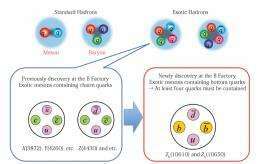 (PhysOrg.com) -- Two unexpected new hadrons containing bottom quarks have been discovered by the Belle Experiment using the High Energy Accelerator Research Organization (KEK)'s B Factory (KEKB), a highly-luminous, electron-positron collider. These new particles have electric charge and are thought to be "exotic" hadrons -- non-standard hadrons, containing at least four quarks. Previously, a series of new and unexpected exotic hadrons containing charm and anti-charm quarks have been observed. This latest discovery from Belle demonstrates the existence of exotic hadrons containing at least four quarks in a particle system including bottom quarks . The Belle Experiment has discovered two new unexpected particles at the KEK B Factory (KEKB). These new particles, termed Zb, contain both one 'bottom' quark (the second-heaviest quark among the known six types of quarks) and one 'anti-bottom' quark (the anti-particle of the bottom quark). Moreover, they have electric charge and thus are thought to be hadrons in which at least two additional quarks other than the bottom quark and anti-bottom quark (at least four quarks in total) are bound together. Figure 2. Production of Zb in an electron-positron collision. Immediately after being produced, the Zb decays into a bottomonium ( Υ or hb) and a charged pi meson (π±). The bottomonium then decays into a pair of muons (μ±), which are subsequently measured with a detector. A large amount of data containing particles produced in electron--position collisions using the KEKB accelerator, which has achieved the world's highest luminosity, has been obtained. While focusing on 'bottomonia,' heavy mesons composed of one bottom quark and one anti-bottom quark, we conducted a detailed analysis of events involving two types of bottomonia, the Υ and the hb. This analysis revealed two new unanticipated charged particles that decay into a bottomonium (Υ or hb) and a charged pi meson (π±), which were then called "Zb(10610)" and "Zb(10650)" according to their mass values, 10610 and 10650 MeV/c2, respectively. They are approximately eleven times heavier than a proton. In principle, a bottomonium particle's charge is zero; therefore, these charged Zb particles should have at least two more quarks, e.g. one 'up' quark and one 'anti-down' quark. Several hundred mesons have been identified to date. All of them are thought to be bound states of one quark and one anti-quark, with the binding provided via the strong interaction of elementary particles. Using the KEKB accelerator, however, the Belle experiment has discovered more than ten 'exotic hadrons,' including the X(3872), Y(3940), and Z(4430), which were not anticipated by existing theories. These new particles, which are about 4-4.5 times heavier than a proton, may be exotic hadrons consisting of one 'charm' quark and one 'anti-charm' quark plus two more different types of lighter quarks. These unexpected discoveries have attracted the attention of researchers around the world. The latest discovery has revealed the existence of exotic hadrons containing bottom quarks, which are heavier than charm quarks. Figure 3. Mass distributions of parent particles, which are calculated from the momenta and energy of measured bottomonium and charged pi meson for the cases when bottomonium is Υ (left) and hb (right). Peaks corresponding to the mass values of 10610 MeV/c2 and 10650 MeV/c2 can be observed for both cases. The Belle B Factory experiment, which began in 1999 with the aim of elucidating the origin of particle-anti-particle symmetry breaking (CP violation), has contributed to the Nobel Prize in Physics in 2008 awarded to Drs. Kobayashi and Maskawa. Moreover, data obtained from electron--positron collisions with the world's highest luminosity achieved at the KEKB accelerator have resulted in a series of unexpected discoveries of exotic hadrons, opening a new research frontier in particle physics. Data taking at the Belle Experiment has already been completed, but a vast amount of data is still awaiting detailed analysis. Moreover, an upgraded version of the KEKB/Belle Experiment, called SuperKEKB/Belle II is currently being prepared. Belle II aims to collect 50 times more data than the earlier experiment. Researchers are eagerly awaiting the opportunity to explore the full spectrum of exotic hadrons containing various types of quarks, including strange quarks, as well as charm and bottom quarks, which are expected to be discovered in the future at the SuperKEKB/Belle II Experiment. It is worth noting that quarks are bound by the strong interaction and confined to composite particles, such as mesons, and thus cannot exist individually as free particles. The detailed exploration of exotic hadrons will advance the understanding of how and what types of hadrons are possible based on the mechanisms defined by quantum chromodynamics, which describes the strong interaction. A paper reporting this achievement has been accepted for publication by Physical Review Letters on December 30, 2011, and will be published shortly. Anyone else accidentally read the headline as 'heavy exotic hardons'? It just illustrates the power and effectiveness of electron-positron colliders, which are enabling to achieve a much higher energy density and beam luminosity than the LHC at the much lower cost. The hadron collisions are too fuzzy and suffer with low signal/noise ratio. and 'bottomonia' (Y or hb), seems to me they are identical but maybe iam missing something Fundamental.